True story: I once had a dream that I was being chased by someone who was trying to hurt me. I was able to find refuge, though, inside of a giant, hollowed out chocolate cupcake. I wonder what Freud would have thought of that. So maybe I have a cupcake obsession. And not only am I obsessed with baking them (I wish that was the extent of it! ), I also find it impossible to make a batch without eating at least four of them. I have to try one when it's still warm, fresh out of the oven, another once it's cooled, a third in it's completed, frosted state, and a fourth just to mull over the taste again. I have a serious addiction. 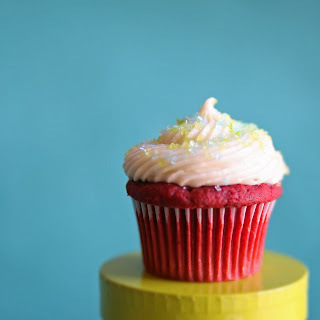 In my on-going quest to find the perfect cupcake, I've discovered some pretty tasty recipes. One of my favorite is a red velvet cake from Portland's Saint Cupcake. If you're not familiar with red velvet cake, it has a chocolate flavor however the cake itself is a rich red color. Do your taste buds a favor and try this recipe. You can thank me (and the almighty Saint Cupcake) later. This is the most-requested cupcake at Saint Cupcake. At the bakery, they frost it with their secret cream-cheese icing. Use your own favorite icing recipe and, for Easter, decorate the just-frosted cakes with green-tinted flaked coconut, tiny jelly beans or sugar sprinkles. Preheat oven to 375 degrees. Line two standard-size muffin pans with baking-cup liners. In a bowl, whisk together the cake flour, salt, cocoa and baking powder to combine. In a pitcher, whisk together the buttermilk, food coloring and vanilla until blended. In a stand mixer set on medium to medium-high speed, beat the butter and sugar until light and fluffy, about 5 minutes. Add the eggs, one at a time, beating until fully incorporated; scrape down the sides and bottom of the bowl as necessary. Add the flour mixture in portions, alternating with the buttermilk mixture, until smooth and just blended. In a cup, combine the vinegar and baking soda, allow to fizz, then fold into the batter by hand. Working quickly, divide the batter evenly among the muffin pan cups and place into the oven immediately. Bake for 15 minutes, then check the center of the cupcakes with a toothpick. If you have a few crumbs clinging to the pick, the cupcakes are done. If the pick is coated with more than a few crumbs, return cupcakes to oven for a minute or so, watching closely. Cool cupcakes in pan on a wire rack until cool enough to handle, about 15 minutes. Carefully lift each from pan, and set on wire rack. Cool to room temperature before icing, about 30 minutes. Ooooh thanks.. I also have a cupcake obsession! I am glad I am not the only one who can't bake with out eating my way through the process. I have never tried Red Velvet--this may be a sign that it is time. these look INCREDIBLE. I've never been much of a baker (I would choose salt over sugar) but it looks like it's time to start. I am loving your blog!! Just found it a few days ago. I tried the cupcakes yesterday and they were great. I have not done cupcakes from scratch before and it was really fun. I wish my frosting looked as decorative as the picture, but they still tasted good! I'm really going to have to try these! I've never tasted red velvet and it sounds delish + pretty. Will do!